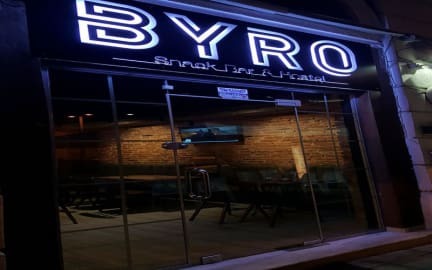 BYRO Hostel is located near the city center, in the main boulevard, making it an excellent starting point to see some of the most interesting sights in Durres. In only 3 min walk you will find the famous Durres amphitheater 3000 years worth of history, the old city walls and Venetian tower. Other historic sites, like the Market and Thermal baths are 10 min away. You'll find yourself in the Volga promenade, where you can relax and enjoy amazing views of the sea and sunsets in only 10 min. 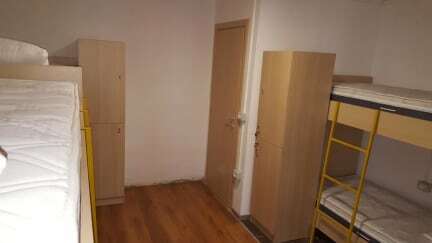 We have 3 rooms with 8, 6 and 3 beds (for a total of 17) and the 3-bed room can be used as a private room as well. Our rooms are equipped with AIR CONDITIONING. Our 2 bathrooms include showers, and there is also a pay-per-use washing machine. You can relax in our garden where you can have our complimentary breakfast, or enjoy a beer or cocktail at the bar on the first floor. Every weekend you can enjoy live music at the bar and have a taste of the local atmosphere. You want to cook something yourself? Our kitchen is at your disposal. We also provide airport transfer at request. Looking forward to having you here!